A world of complications on your wrist. 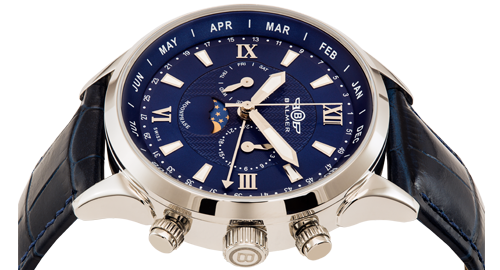 46mm men's Complete Calendar dress watch. 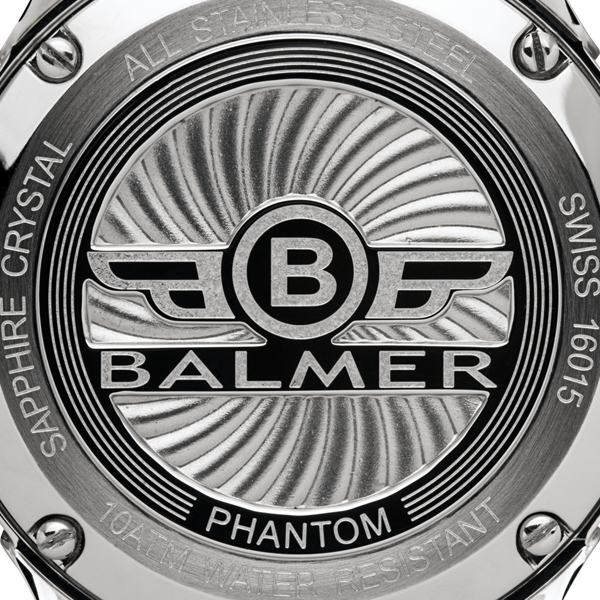 The Phantom and Phantom II collections were historically some of Balmer's most popular models. Taking the classic design of the Phantom II and reviving it with elegant new colors and a more refined execution, we expect a whole new legion of fans for this model. The 316L stainless steel case is 46mm in diameter which provides a large opening for the dial, making it easy to read all of the amazing complications displayed on it. Peering through the Sapphire crystal you'll see displays for day of the week, calendar date, hours/minutes/seconds and a pointer-date that also keeps track of the current week of the year. All of this is powered by the accurate & reliable Swiss Ronda 706.B movement for a lifetime of worry-free timekeeping. The genuine leather strap is finished off with a push button dual deployant clasp. Inlaid with a generous amount of Superluminova for perfect low-light legibility. 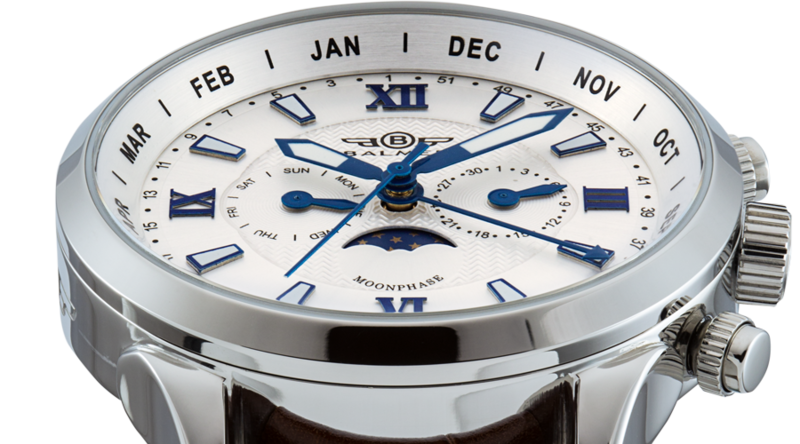 Swiss made, quartz, analog, master calendar. Ronda Normtech 706.B 5 jewels, gold plated. Date, Day, Hour, Minute, Seconds hands. 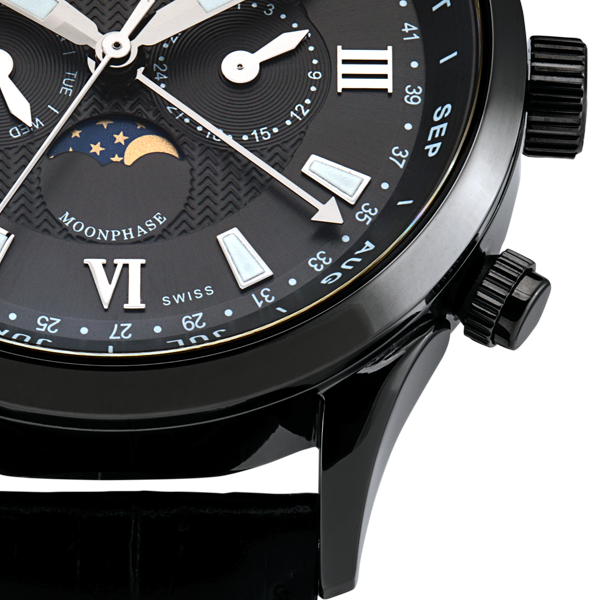 Moonphase. Day and Date by Hand. Standard 371 battery, 1.5 Volts, Battery life up to 60 months. Soft Leather with Contrast stitching. 24mm x 200mm Strap Size. 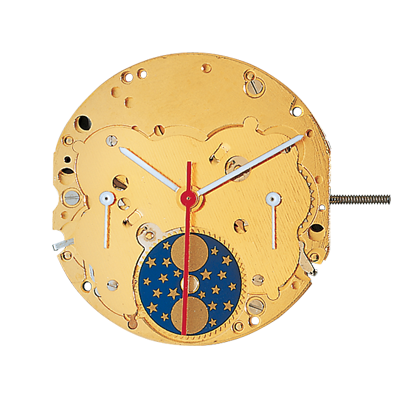 These quartz movements are engineered for stylish timepieces and watches with high functionality and particularly unique designs. Heirloom quality luxury watches with modern sophistication. 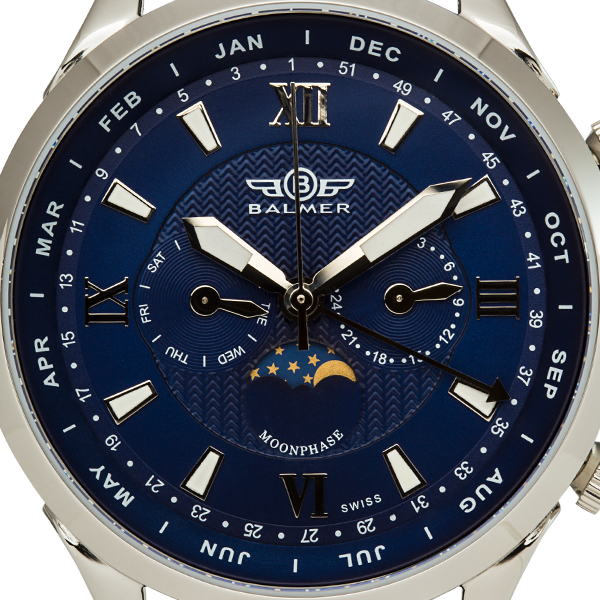 Having the finest materials at our disposal and some of the most talented designers in the industry, Balmer continues to evolve and create stunning Swiss Made luxury designs. 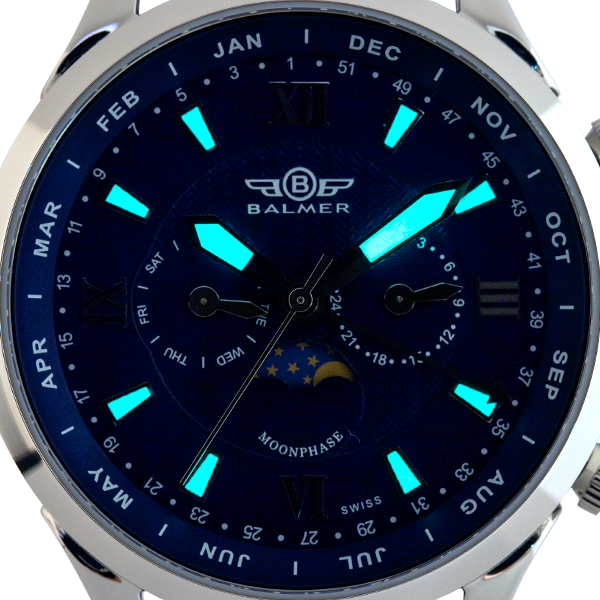 With an attitude of no compromise, and bold designs that speak to the heart of all passionate watch lovers, Balmer offers timeless creations in modern architecture.